This sequence of 39 sketches attempts to describe a room. 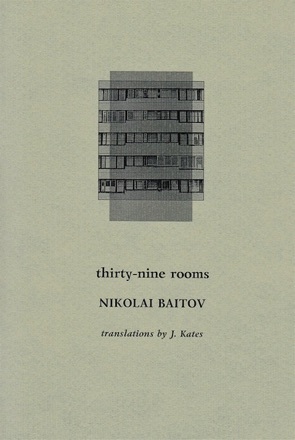 Nikolai Baitov, born 1951 in Moscow, where he continues to live, was educated in higher mathematics, and worked for twelve years as a programmer. In 1987 he quit to become a church custodian. Between 1985 and 1989 he collaborated with Alexander Barash on the magazine Epsilon-Salon, and then with Sveta Litvak in the Literary Performance Club.From 1998 to 2006 he curated the literary salon ‘Premyera’ for the Zverevsky Center for Modern Art. His publications include Равновесия разногласий (Equilibria of disagreements, 1990), Bремена года (Seasons, 2001), Что касается (With regard to, 2007) and Резоны (Reasons, 2011). He was awarded a Brodsky Fellowship in 2007 and an Andrey Bely Prize in 2011.
over there. A watch, a cup. Here is my room. Dust on the icons, thick. In the cracked icon-lamp a dessicated wick.